I believe that a love of reading is learned. 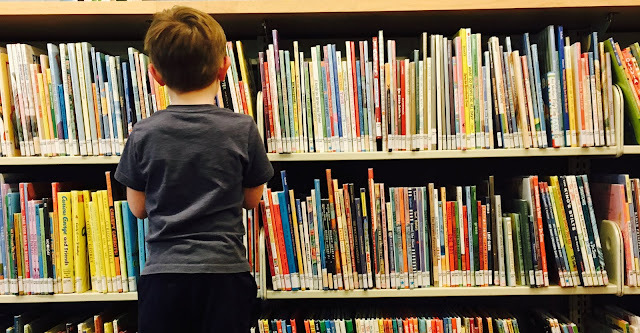 Children need to be introduced to great books, taken to the library, wander around bookstores, have conversations about the concepts, stories, and characters they find in books. We can each make reading a conscious part of our family culture. I'm still figuring out exactly what that means, but here are three things that are working for us. At least for right now. 1. Start early. The benefits of reading to and with very young children are many: improved speech, concentration, and cognitive abilities, stronger parent-child bond, enhanced creative thinking. But that's not really why I do it. I start reading to my children early because it's a way of sharing with them something I love and has enriched my life. 2. Read often. We read in the morning, we read in the afternoon, we read at night. We're not necessarily reading for a long time. We don't always finish every book we start. The time, duration, and selections vary every day, but whatever form it takes, it is part of every day. 3. Be selective. Have you been to the children's section of the library lately? You can't just pick a random book off the shelf and expect to be wowed. Sometimes I think parents expect very little from children's literature and that's exactly what they get. For every amazing children's book there are probably half a dozen terrible ones. There are so many beautifully written, beautifully illustrated, clever, entertaining, and engaging children's books to choose from. For heaven's sake. Be picky. And- enjoy. Enjoy the special time reading provides us with our children, and the precious/rare/sanity-saving moments of quiet when they're reading on their own. Enjoy watching your kids learn new things, get excited about characters and plots, and get interested in new subjects. This is an opportunity- not a chore.